Good for you! We want a full report on how it goes. Full report and hopefully some good pictures! its one thing to say "you'll be ok" . its totally another to be able to say "Ive been where you are"... Thaks for having this program available for kids. I posted this in Dave's section but thought I would add it here too, that Dave is definitely confirmed to be at the benefit concert. It will be great to see him again. Seems like it's been forever! Great show last night. Great to have had a chance to talk to the guys again and finally get to meet Gilby Clarke! Here's a few pictures from the show and my 2 videos. The sound is pretty bad. I think because I was right in front of a speaker, not that I"m complaining! Have to say, it was great to see Slash, Duff, Matt, and Dave on stage together. As well as Slash, Duff, Matt, and Gilby. Nothing like it in the world! 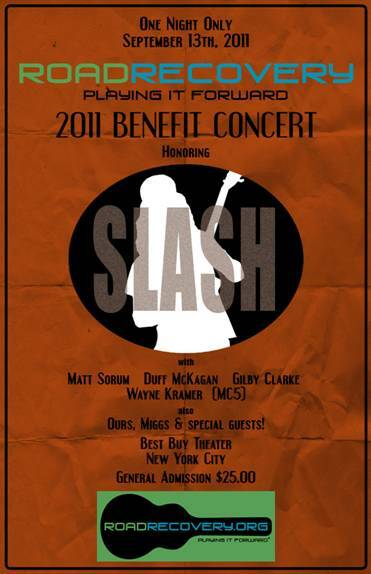 Matt Sorum (VELVET REVOLVER, ex-GUNS N' ROSES), Duff McKagan (VELVET REVOLVER, ex-GUNS N' ROSES), Gilby Clarke (ex-GUNS N' ROSES) and Wayne Kramer (MC5) are among the musicians who performed at the Road Recovery benefit concert honoring legendary guitarist Slash (VELVET REVOLVER, ex-GUNS N' ROSES) this past Tuesday, September 13 at Best Buy Theater in New York City. The event was a semi-reunion of sorts, with Sorum, McKagan and Slash having played in both VELVET REVOLVER and GUNS N' ROSES, while Clarke played with them in GUNS during that band's "Use Your Illusion" tour. Road Recovery is a non-profit organization that works with at-risk kids. One hundred percent of the money raised at the show will go directly to support the treatment of children and young adults who suffer from adversities such as addiction, physical and sexual abuse and chronic illness.